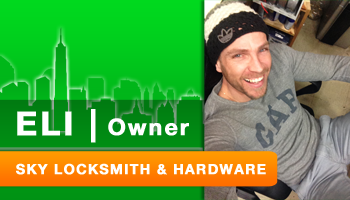 Sky Locksmith & Hardware is an exceptional place to buy home and hardware products, including locksmith services. Your shopping experience and satisfaction is important to us. Sky will deliver high-quality products in excellent condition to your door. If for any reason your shipment is not satisfactory, we will gladly replace it or accept a return of merchandise. defects. Returns must be made with original packaging and store receipt. Please inspect all merchandise upon receipt. Claims for shortages, breakage or damaged goods must be made within 3 business days after delivery, or they will not be honored. Returns can only be made within 14 days of receiving your product. Exchanges can only be made within 14 days of receiving your product, restocking fees will still apply. Key Copies- Defective Keys cannot be returned to the store without the original receipt and original key copy. Defect/wrong cut will be identified in shop and refund processed. Key cutting is not an exact science, and second cuts may need to be made to fit your existing lock. Warranties are not permitted for any items that are supplied by the customer. Special Orders may not be returnable. Please ask us for more information. *DEPOSIT FOR SPECIAL ORDERS ARE NON REFUNDABLE.